Spanish for Children and Parents, Level 2, is the continuation of Spanish for Children and Parents, Level 1. Beginning with a review of regular verbs in the present tense as well as some previously-studied irregular verbs, it proceeds to introduce more grammar. The emphasis in Level 2 is on Spanish irregular verbs, object pronouns, reflexive forms, command forms, preterit and imperfect tenses, and a rich new vocabulary. New release! Spanish for Children and Parents, Level 2, 2nd COLOR edition. 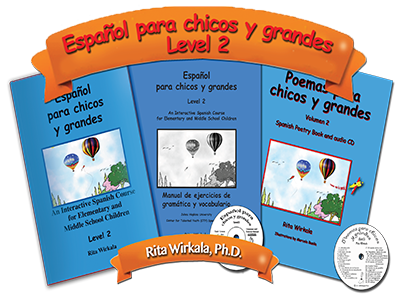 This 2nd, colored edition of Español para chicos y grandes ll also features, at the end of each chapter, the amusing cartoon episodes of Las aventures de Bobi y Cuqui, an expanded edition of the characters introduced in Level 1 and much loved by students.